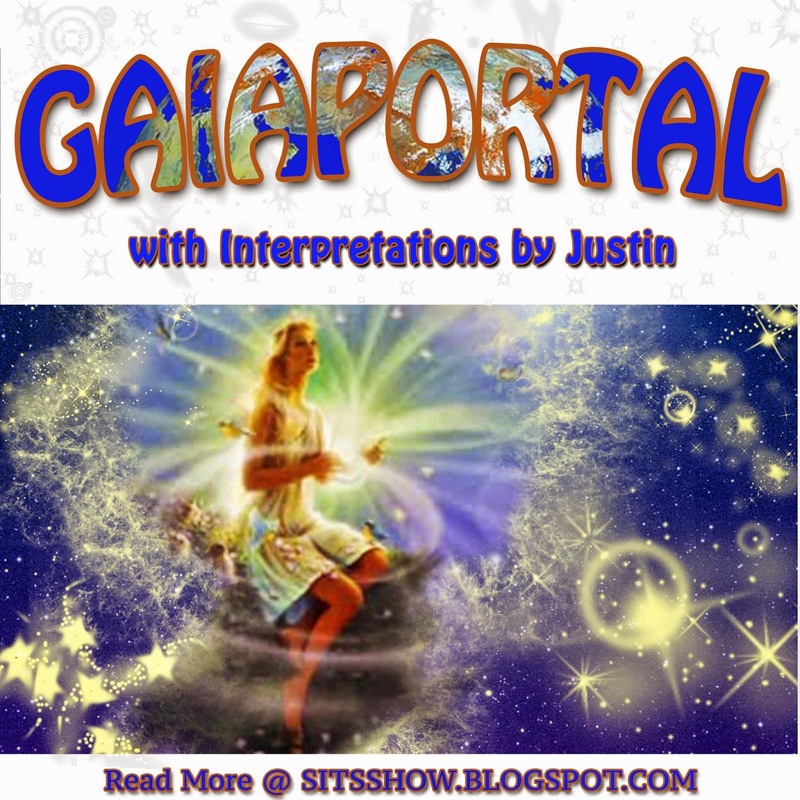 The raw Gaia Portal update is first, followed by my extrapolated meanings below in black. Possible Meanings: "Morphological transmutations occur easily at this moment." - Morphology is the study of organisms, their form and structure, and is used in relation to transmutation. This suggests physical body vehicles, or temples for the soul as they are called in some circles, are undergoing a tangible process of change, indicated at the end of the statement by the phrase: occur easily at this moment. Easily here suggests that at one time the transmutation process was more difficult. The upstepping process being offered as coherent energies to humanity are not automatic, each individual has a free will choice to receive them or not, however the choice not to receive them, or remain ignorant comes at the cost of disempowerment, and an increasing experience of chaos, as the process continues. depending on the frequency used. Entrainment is of course the primary method used to accomplish this, as the Ambrosian Energetics are poured out on to the earth. Cymatics is one of the best examples of entrainment physically changing a system to reflect the frequency, form and character of the source. Each body acts as a resonator for the larger system it is enclosed in, the earth is our larger system, which entrains its frequencies to all life, hence the schumann resonance harmonics are seen everywhere on earth, especially in living systems. 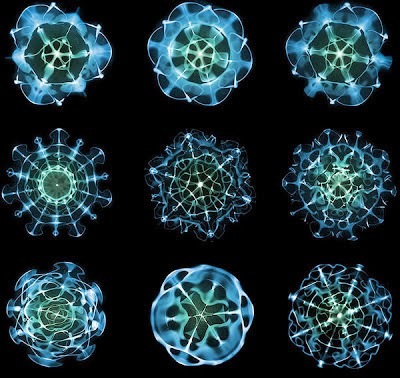 Using Cymatics as an example: if the frequency shifts, the 'bodies' in the cymatic fluid change accordingly, making new geometries or morphology. Since the physical universe (mind and body) is always in motion, all things which appear to be static or fixed are actually standing waves of movement, and as such are capable of being changed by entraining signals. The larger or stronger signal frequency entrains systems within it to match the larger system. Please see the previous update for a detailed explanation of how entrainment works. This all suggests our bodies and minds are undergoing profound changes, which will affect our experiences as time goes on. 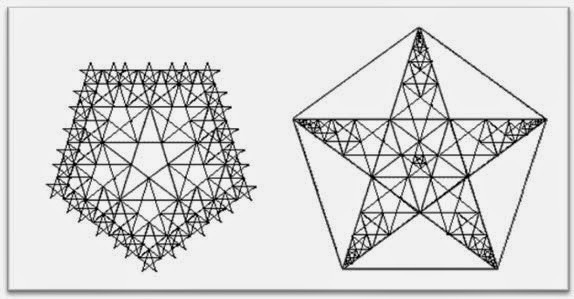 This is 2 examples of a pentagon or star fractal, a pattern which is self similar. The part reflects the whole. "Intensities of inner uprisings increase." 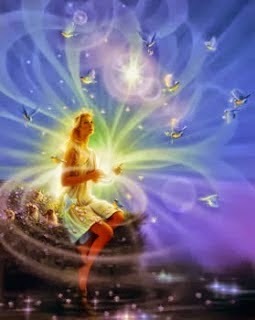 - An inner uprising suggests aspects of our higher self, or unactualized potentials coming to the fore. There are many sciences which suggest our reality is holographic, or fractal in nature, which means that all things are not only interconnected, but reflective of each other: as above so below, as within so without. The logic behind potentials actualizing is simple, yet often met with confusion due to chaos programing in our modern world. We are conditioned from birth to think life is chaotic, coincidental, and random in nature, however there are many ancient and new age schools of thought which suggest a higher self, an aspect of self that is fully complete, existing out of space and time as we know it. This is what the term eternity refers to, not just infinite time and space, but beyond them in a totally perfected and ultimate form of absolute unity. The Law of One and Urantia book are two works I have personally studied which disclose the opposite, that everything is indeed interconnected and that our 'true self,' so to speak, is being realized dependent on our choices. Again the mechanism that facilitates this, what one could call 'absolute tech' is the entrainment process. Essentially there are two versions of ourselves, one that exists in its perfect and complete state of eternity. The second is the actualizing self we presently experience now. As we choose to reflect reality more clearly within ourselves, the actualizing self begins to resemble the higher self, and information flow is increased; i.e. intuition, insight, clairvoyance, etc. Hence the reference to intensities, indicating that the clarity and potency of these data transmissions is growing stronger. Latitudinal solar energy hits the earth moving from east to west or west to east depending on your point of view. "Latitudinal excitations permute essentials." - The term latitudinal is a reference to north south orientation on the earth, the equator is the zero point in this system. The term excitation refers to an upstepping or increase in the energetic expression of a thing; turning up the volume in your car to hear music is an excitation process of making it louder. The term permute refers to a process of alteration or changing, and harmonizes with the first statement in this update. Permutations also refer to the number of possible ways a system can orient itself. For example, when flipping a coin, there are 3 possible permutations to the end result: heads, tails or landing on its side. Finally, the term essential refers to something that must be in place, in order to achieve a desired result or for a phenomenon to emerge. For example, water is essential to make tea, without water, you can not make tea, it is needed. 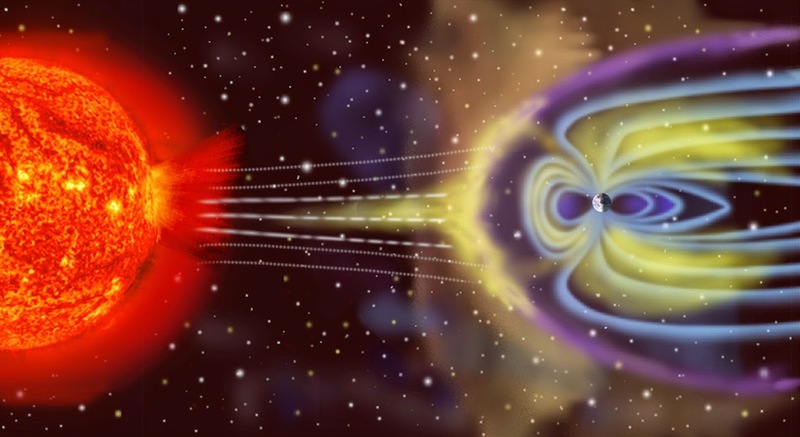 Taking all this into account, the statement suggests that energies are flowing inline with the latitudes, possibly due to solar emissions and increasing the energy output such that the baseline aspects are changed. This resonates strongly with the above analysis. Further, this statement is generalized, and most likely applies to not only Gaia at larger, but individual embodiments as well. "Grand architectural models are shown for all with eyes to see." - The term architectural refers to a single unified overall design, most easily recognized as the themes in buildings and houses. This term also can be thought of as a fractal or self similar structure, that has elements at each level which relate at different scales. The phrase as above so below, as within so without is describing a fractal relationship. Models are analogs or a reflection of another thing, usually created from a larger or grand source. 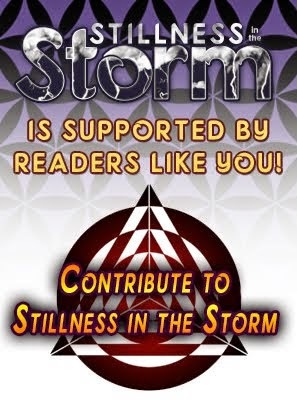 Keeping in line with the cymatic geometry imprinting via entrainment theme, this statement suggests that the holographic structure is being actualized on earth to a high enough degree, enough to be recognized by all. Pattern recognition develops as experienced is gained, so long as the quality of the image or memories reflected in the mind are accurate, which means that one's ability to recognize the grand plan is directly dependent on the quality and completeness of their knowledge base. Even those who are choosing to remain asleep or ignorant, still perceive the changes, but are unable to understand them, manifesting as uncontrollable emotional states. 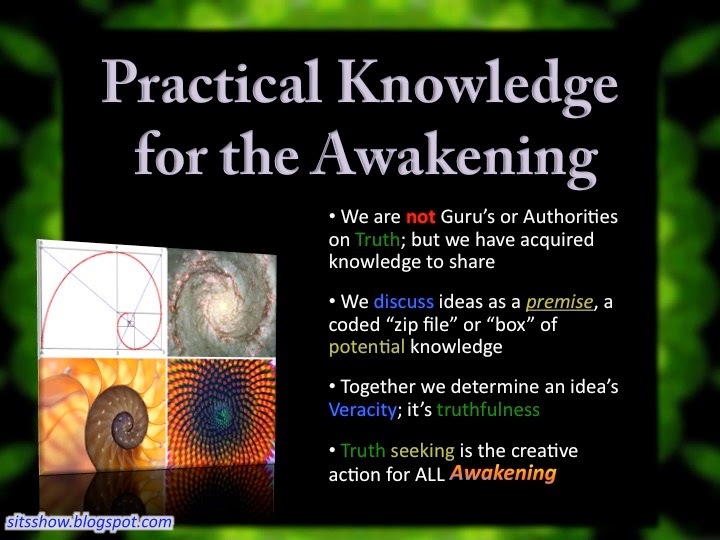 Those who have chosen the truth seekers path will find it easier to channel these energies, and actually provide a grounding mechanism for the sleeping masses. In that sense, each of us who continues on the path of personal awakening is essential to help others start on their journey, offering their knowledge when possible, and assisting others to recognize the grand plan of creation in the loving way it was designed for.